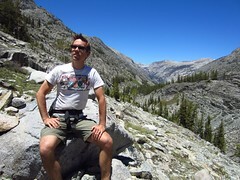 Got back last week from a very much needed backpacking trip in the California mountains. I was out in SF for a conference, and decided to stay a bit longer to see old friends and get some time out in the mountains, enjoying nature, and being offline (for more reasons why i love backpacking, see my honeymoon post). I was prepared to go solo, but was happy that my friend and old roomate Damian Spain could join me. I chose Goddard Canyon because it had plenty of water along the route, the trailhead was in a national forest (easier to get permits vs national parks or wilderness preserves), had a ferry, hot springs, and a waterfall, several options for camping (campgrounds are * on key points) and was below 10,000 feet so we could have campfires. We planned for 5 days, but on the fourth day we decided to hike extra and drive home that night. It was an amazing trip and would totally do it again. This was a busy day. We left SF at 7am, got permit around 11, had leisure lunch and drive to Florence lake, stopping by other dams and lakes, campgrounds, and ranger offices, arriving at the lake around 3. The ferry was not operational for the season yet, so we had to hike 3.4 miles more than we planned, putting us around the private ranch around sunset. We had trouble finding the campground by Blayney Hot Springs, so we just put up our tent along the jeep trail near the ranch. (Day 4 we found the campground, see below). If you arrive at night, another option would be to camp at one of the many car-camping campgrounds along the road about an hour from Florence lake. You can get a backcountry permit at a smaller High Sierra ranger office near Mono Hot Springs (map) the next morning, and have plenty of time to hike to the nice campground by the river and the hot springs. This was a much easier day then the previous day. We stopped because the campground was so nice – part shade, part sun, nice campfire ring, plenty of wood, 50 yards from river and a little off trail (but still very visible to hikers). One of the more interesting moments of the trip was when i stopped to fill up water in a small stagnant lake – a few leeches got on my water filter. There were always tons of large black ants around, so i decided to give the ants some lunch. Upon arriving at the campsite we took a nap and had a late afternoon campfire. Day 3: Dayhike – Hiked about 10 miles up Goddard Canyon to see the falls, turned around before hitting Hell For Sure Pass. Elevation 8,700′ to 9,700′ back to 8,700′. This was another easy day, we did it without packs and returned to the same campsite. Goddard Canyon was similar to what we had seen so far, just more granite and a more narrow canyon. The river was also a bit more interesting, having 5-10 feet granite walls in several places. The falls were impressive, but next time I’d like to try going up Evolution Canyon instead. Day 4: Hiked 16-ish miles back to car. Elevation 8,700′ to 7,326′ (Florence Lake), drive back to SF. By this point we had acclimated well to the elevation, so hiking was easy. We made it from our campsite to Blayney Hot Springs campsite by lunch time (over 7 miles). As it turns out, the campsite is right by the river, about a half mile from the main trail (just follow signs to Blayney Hot Springs). We found campfire rings but could not find the hot springs – later we figured out you must cross the river to the hot springs which lie in the meadow. At lunch we decided to cut the trip short and hike all the way back to the car and drive home. Damian said he had to be back to try on some dresses (or something like that). I actually had a blister on the bottom of my left foot so I was also down to finish off hike. We had an amazing time up to that point and I was completely satisfied. On the way home we stopped in Fresno for enchiladas, only Damian was too tired to read the entire menu and got something else instead. We arrived in SF about 2am thanks to D’s mad driving skills. In summary we hiked about 40 miles, drove 13 hours, saw beautiful mountains, lakes, amazing trees, and animals, had time to relax, play with fire, get lots of exercise and fresh air, and had that reset button pushed hard. Can’t wait to make it to the Sierra Mountains again. When we first arrived at the airport, we got our rental car and drove to the town of Kalispel, the largest of many small towns in Flathead valley, just west of the park. We stopped by a famous house, the Conrad Mansion, barely catching the last tour of the day. It was an impressive house and an interesting tour – built over a hundred years ago and restored to its original condition (we took many pics of this). From there we drove to the hills to our first Bed and Breakfast, The Garrison Inn. Our hosts Gene and Anne Marie were very nice. Gene is also a professional chef and made us a delicious dinner and an amazing breakfast – probably the best omelete I’ve ever had (insanely fluffy, almost a quiche). After the B&B we drove about an hour before entering the park. We debated white water rafting and horse back riding, but decided water was too cold and horses were not my favorite. We got lucky and found a spot in the Apgar campground, had lunch, then went for our first real hike to the Apgar Lookout. The next day we moved a bit further east, getting a spot at Sprague Creek campground. That day we did one of our longest and most beautiful hikes – Highline trail from Logan Pass to Granite Park Chalet, then on down to our car at The Loop, about 12 miles total. We saw our first big animals – mountain goats. Did you know they have bacteria in their stomach that generates heat? That helps them survive the mountain tops during 40 below winters. That night we slept super solid – 7 hours of hiking will do that to ya. The next day I gorged on the breakfeast buffet at the lodge (totally worth it), then we drove over the to east side on Going to the Sun road, which was supposed to be awesome but all the road construction made the experience a bit annoying. That night we stayed at St. Mary campground and were lucky enough to catch a performance by the Blackfeet tribe, the native americans who live east of the park. They explained their music, competition dances, and costumes in great detail. Big props to traditional Native Americans. Afterwards we had our first campfire. I love fires. The next day we got up super early (6:30am) to get to Many Glacier campground to ensure we get a spot. It’s the most popular campground in the park, and, like all but 2 campgrounds, takes no reservations – first come, first serve. All spots are snatched up by around 8am-8:30am every day. After securing our spot, we took the day off from hiking and explored the Many Glacier Lodge and surrounding areas (the great lodges are amazing). I also explored my book and the back of my eyelids in the afternoon (gotta have naps on vacation, right?). We had a camping stove issue that was resolved the night before (oh, thats how you clean it) and this was the first day we had hot meals from the stove. Previously we snacked on bars, PB, fruit, nuts, broccoli and hummus, bread, cheese, crackers, and pickles, which were all good. 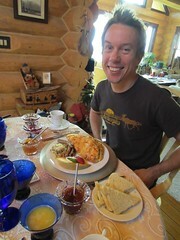 Now we had hot oatmeal and other warm dishes like rice and beans and indian food. We saved the freeze-dried for backpacking. Our second day at Many Glacier we hiked to Iceberg lake. We wanted to hit up Grinnell glacier, but that was closed due to bears. So guess what we saw about 150 yards off the trail to Iceberg lake? A grizzly bear and her 3 cubs. Awesome. We also saw a mama moose and her baby – from only a few feet away as they were on the trail. 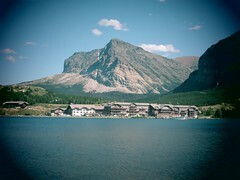 The last day at many glacier was more chilling out, shayna did a short hike and I did some picture/laptop stuff. That evening we had our first rain storm and were lucky enough to be able to watch it from the lodge. Later after that we had another campfire along with s’mores. Mmm-mm. Saturday morning we left Many Glacier to start our backpacking adventure. We drove to the Chief Mountain Trailhead, which is right next to the Canadian border, to enter the Belly river area of the park. It was about 10am when we began backpacking, a mostly level hike 13 miles to our first camp at Glenn’s Lake Head. Let me reiterate how unbelievably beautiful this park is. Gorgeous natural diversity, from moutains, glaciers, snow, streams and lakes, to fields of grass and flowers, to rocky and dusty mountain tops, to pine and aspen forests, and more .. sometimes all at once. 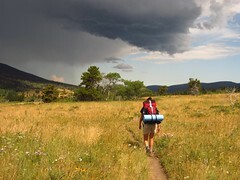 The highline trail gave us a taste but being surrounded by nothing but pure nature takes it to the next level. The next 2 nights we spent at Elizabeth Lake head campground (i say head since the bigger lakes have 2 campgrounds, one at the head where water comes in, and one at the foot where water exits). Each night we had to store all our food, toiletries, even water in bear bags and hang them high up in the trees. We also had to prep food and eat in common areas. It was a nice way to meet people – we met boy scouts, families, and several couples .. but not the most romantic. 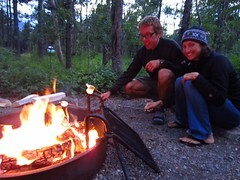 Except the first night, where we had a campfire and more s’mores, we crashed pretty early – often before dark. Once shayna was down for almost 12 hours, after hiking probably the most scenic hike on the trip, up to Ptarmigan tunnel. 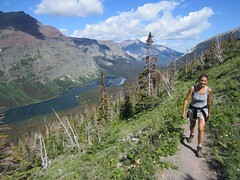 It was 12 miles roundtrip, over half a mile vertical, with the most diversity and impressive views of any of our hikes. It was tough, but thats how we like it. Gotta earn it. Other adventures included discovering amazing waterfalls, fording rivers, and dealing with hail storm on the last day hiking out. The last 2 nights of our trip were just us appreciating showers, beds, nice meals, and relaxing. It went by much too quick. This trip was definitely a backpacking and camping trip first, and honeymoon anniversary second. I say honeymoon anniversary since this trip, being a backpacking trip, was more similar to our honeymoon backpacking adventure on Isle Royale (more deets) than our wedding That said, wife and I had an amazing time together. I feel so lucky to have a girl who is into backpacking almost as much as I am, even though she’s only been on 3 real backpacking trips! We both hope to do at least one major trip a year from now on. So stay tuned for more adventures. Groove Armada doing superstylin for like 20 minutes, including a few mins of daft punk in the middle. After “Around the World” they unloaded the superstylin’ drop that totally electrified the crowd. This was my favorite moment this year – 3rd favorite coachella moment of all time, after daft punk in 2006 and my personal fav squarepusher in 2001. The Do Lab giving off a great burningman vibe, sick music, interesting art and decorations, water hose, and central location. My favorite spot. Video. Big UP to Jupiter, Random Rab, Beats Antique, Lucent Dossier, and many more. The Dome was another sound location in addition to the Do Lab and the 5 official ones – they provided sound as you entered and left, going till 5am for those in camp city. LA Riots played sunday night. Naked Hippie getting tasered. 3 fat cops using a taser on a dude out of his mind. article. Contact solution containers are very useful. Yeah Yeah Yeahs rocking it – love that gold costume, Karen O. video. Girl Talk really knows how to rock a party, short-attentions span style. milkshake. MIA was good, but Blackstar (her Coachella DJ) went a little crazy with that air horn – could barely hear the songs. Lame. The Black Keys got Soul, damnit. a video. Leonard Cohen rocking it at age 74. Morrisey left the stage early cuz he smelled burning flesh. Sigh. Pass the Bacon. The Cure did almost 3 hours – including 2 songs after they cut the sound and lights (only saw first hour, tho). I heard Paul McCartney, would have been really impressed if i still loved him. Wish I saw Etienne De Crecy. Awesome video. Wish I saw MSTRKRFT, saw them in 2008. 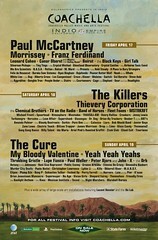 Wish I saw Roni Size, The Kills, Atmosphere, M Ward, Crystal Castles, the Orb, etc. Out of 166,000 people attending coachella, I ran into my boy Zac (chicago) twice. I ran into tons of other people from California as well. Attendence was second only to 186k in 2007 (src). It all began with my arrival Thursday night, along with checkoway and kerry, crashing at my friend Rob’s place in Ontario. Friday morning our new best friend Jason picked us up in his super 80’s Van – Our Carpoolchella. The rumor was that one lucky crew with “Carpoolchella” written on their car/van would win lifetime vip tix to coachella. No, wed were not that lucky crew. Anyways, we drove 80 miles to Palm Springs, got supplies, checked into our house for the weekend, and met up with Isabel (not Babs), Jess, and Brian. We got our drinks on and headed to coachella friday, coming home around 1 or 2 and staying up till 5 in the morning. 2 hours later I’m up for some reason and ready to go. Saturday started with more drinking, a surprise arrival by Ding Dong, Cake-Oh, and Katheeee. Yay. After some pool shenanigans we left the house for the iMeem party – more pool, free-drinks, DJs (A-Trak was there but did not spin), and great people watching. It ended up being pretty fun, till the Asahi ran dry. We made it inside the coachellas around 5 or 6 and lasted till about midnight, then home and more drinks and late nite grilling by Chef Checkoway. Sunday was more of the same, morning cocktails, donger made eggs, pool chillin, a few visitors, and music at coachella from 6 to midnight. I was planning on leaving sunday night but I aborted that plan due to lack of sleep and desire not to get sick. Monday we cleaned up and left the house by noon, made it to LA where most of us did more pool side chilling at the roosevelt in hollywood. Around 6pm everybody left but me and checkoway – he was in LA for biz and my flight didn’t leave for chicago till 6am the next morning. Lee Williams showed up, instigating round 7, and with the help of Katie Curry we were out drinking till the bars closed. After some post-bar pizza I took checkoway back to the hotel where i crashed from 3:30am till 4:30am (thats 1 whole hour of sleep for you kids at home), got up and taxied to LAX. Needless to say i slept the entire plane ride home. I just bought my ticket to San Francisco for SnowCamp weekend, flying out Thursday 4/2, returning Monday 4/6. Rejoice. I was on the fence about when to visit SF this spring/summer, and Snowcamp won. You really can’t beat it – the best crew of crazy fun loving trouble makers this side of the mississippi (which side are we talking about? 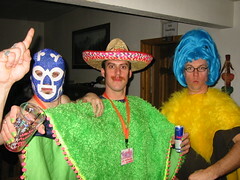 ), dressing up (this year’s theme is Fairy Tales) and enjoying delishous tahoe powder (if it doesn’t all melt by april). In addition, carrying on the spirit of Otto, funds will be raised to send girls from Hunter’s Point to summer camp. Deets on FB. Any suggestions as to which Fairy Tales thing I should dress up as? 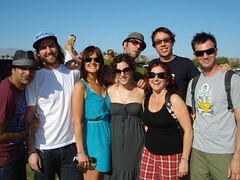 And 2 weeks later I’m going to Coachella Music Festival, another Thurs-Monday adventure which I’m totally excited for. Check out the amazing lineup and our house for the weekend. Last night we got home from a 5 day road trip to our nation’s capital, Washington DC. It was a long journey, 12 hours and 700 miles each way from Chicago, but I’m glad I went. Obama’s inauguration itself was definitely the highlight, being on the mall with about 2 million other people to witness the change of power and the beginning of a new day. It was also great to feel the spirit and mood of Washington – the town was excited, energetic, and happy. Due to some car trouble, we didn’t arrive till late Sunday, missing the “We Are One” concert on the mall. The Sunday show featured Bono, Bruce Springsteen, Stevie Wonder, Beyonce, Garth Brooks, Tom Hanks, Tiger Woods, and more. It also included a nice Obama speech and a test run of the jumbotron video screens and security, among other things. Monday night we headed out on U street near 14th, and it was crazier than a friday night. Restaurants had 2 hour waits, there were hundreds in line to get ben’s chili, and street guys were selling obama shirts, pins, posters, and really bad art. We even passed a car just blaring obama speeches. Not knowing how U street normally is, this probably does not impress you. But trust me, you could feel the energy. 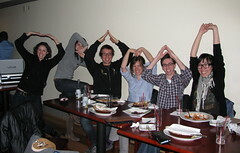 We ended up eating at some Italian place with a clueless bartender as our waitress, but that did not stop our energy from doing “OBAMA!” cheers (yes, that last person in the pic is the exclamation point). Tuesday morning we woke up at 7am at our friend Becky’s apt (border of Adam’s Morgan and Columbia Heights). We walked about 3 miles down to the mall, stopping for Starbucks and snacks. When we were about a mile away it was so crowded the entire width of 18th street was packed with people streaming in. We followed the stream to the Washington Monument, where 2 of our posse of 5 decided to setup camp. Bobby, Shayna, and I ventured on towards the Capitol, mostly just to check things out. We barely crossed 14th street at the north corner of the Mall (Madison Dr). I say barely because there were lots of camo-wearing army dudes that had zero understanding of crowd control and flow, preventing us from crossing easily. Or perhaps they intentionally wanted to funnel thousands of people through small openings, creating artificial crowds irritated and confused to why people weren’t moving, you know, for security reasons. After getting through that, we ventured on as far east as 7th street, which appeared to be impassable. We retreated to the carousel on the south side of the mall near 10th st and setup camp. There were tons of people, but for the most part you could navigate as long as you didn’t try to walk in front of a jumbotron, as you can see in this google satellite picture. It was almost 10am by this point, and the jumbotrons had been replaying Sunday’s show for the last 2 hours, but now they were switching to live action. From 10 to 11am we watched various politicians and famous people arrive, including all those Senators, ex-Presidents, Bush, Cheney (aka Dr. Strangelove in a wheelchair), Bidens, and the Obamas. Everybody got cheers but bush/cheney, surprise, surprise. I was surprised that the boy scouts and girl scouts handed out thousands of little American flags for everyone to wave – very nice move. About 10 minutes till noon Biden was inaugurated as VP, then Obama shortly after noon (altho Chief Justice Roberts redid the oath). When Obama gave his 18 minute inauguration speech (nytimes interactive video), we all listened carefully. We were surrounded by a million people excited to be part of a new era, despite the fact that it was 22 degrees outside and we had been walking and standing for over 4 hours. I was moved by the speech, I identified with it, and definitely felt the moment much more so than if I was just watching it on TV at home. I won’t go into details of the speech, but I will say that I felt hope and inspiration, I felt a reconnection to our politics and policies, and I felt sober and ready to face the future. I was not alone, and many were moved. After the speech we started heading out, fighting confused crowds and poorly designed routes to our friends Becky and David by the Washington Monument. Then we ambled incredibly slow on the massively crowded 18th street back towards Becky’s house. We stopped to eat, rest, and warm up at a nice mexican mexican restaurant – sitting and eating never felt so good. The rest of the night was uneventful, followed by a 11 hour drive home Wednesday (9am to 8pm) with our driving buddies, John and Cat. Go Team. On Tuesday, June 3, I packed up, voted, then left San Francisco for the Sierra Nevada Mountains. At first I wasn’t sure where to go .. 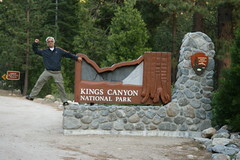 I considered Yosemite, Tahoe, .. but went for Kings Canyon. I did a day hike there in 2006, as well as a Backpacking trip near there at Jennie Wilderness with Juan and Damian in 2004, so i knew what to expect. I got there a few hours before sunset, enough time to eat, setup camp, and walk around a bit before bed. Wednesday I got early and went to the Lodge to find trail info from some backpacking books. I took a few pics of some good hikes, then went to Roads End to get my wilderness permit. The rangers warned that there was still lots of snow .. mostly above 9,000 feet. I considered doing Paradise Valley (start of Rae Lakes Loop), but ended up picking Bubbs Creek to Junction Meadow, with a day hike option to East Lake or Charlotte Lake. I started hiking around 10:30am Wednesday at Roads End (Elevation 5085 ft). It was 2 miles through the valley floor to my first Junction, then I crossed Bailey Bridge up Bubbs Creek, hitting switchbacks out of the valley to Sphinx Creek Campsite (6280 ft), my first rest, about 4 miles in. As soon as I took my backpack off, I brilliantly twisted my ankle. I hurt like hell at first, but turned out mostly OK .. wasn’t able to use it fully for over a week. After water refill and a snack, i continued on to Charlotte Creek. It was 4pm when I stopped, and my GPS watch said i hiked over 7 miles. I wasn’t sure if i had 3 or 5 miles more till Junction meadow (depending on if you trust books, maps, or trail signs), so I decided to camp, since 5 miles more would be too much. I setup tent, got water, cooked dinner – delicious spicy chicken with rice and vegies, and appreciated clean air and sunset. I was wiped out, and was in bed asleep around 9pm. Thursday I woke up 6ish, got out of the tent at 7am, packed and hit the trail by 8. Charlotte Creek (7280 ft) was overflowing, and I had to crawl over wet slippery logs to cross .. my first semi-dangerous adventure. I made it to Junction meadow (8190 ft) around 10am .. so it wasn’t that far after all (about 3 miles according to GPS watch). I decided to setup camp, have brunch, and do a day hike. After some tasty oatmeal, orange and banana, I hit the trail by noon. The rangers warned that bubbs creek would be too high to cross to east lake, but i ran into another hiker (first person I met on the trail) who just came from there – he spent the night on top of snow at Lake Reflection, a few miles past east lake. On his suggestion, i went to east lake instead of Charlotte Lake – mainly cuz it was closer and I’d like to spend some time swimming and exploring the lake. Bubbs creek was super high and I ended up crossing water 4 times, mostly over fallen trees, but the last crossing involved some jumping and getting my feet wet. I ringed out my socks, put my boots back on and kept on. I climbed out of the junction valley up east creek to the most beautiful views (video). I made it to East lake (9475 ft) around 2:30, swam, ate, and sunbathed till 4pm. Happy and fully rested, I hiked back down, getting back to camp by 5:30 (crossing the rivers again without falling in this time). I could feel the elevation but felt great after the afternoon at the lake. My stove wasn’t working, so i got a fire going and boiled water for my beef stronganoff (not as good as the spicy chicken). After eating I basically played with fire till after dark, and was asleep by 10pm. There were 3 other groups at junction meadow, from 2-4 peeps each. Friday i didn’t get out of the tent till 8ish, had a leisure breakfast and wrote in my journal till 11. I then busted out of there, thinking i had to return my bear cannister before the ranger station closed at 3pm. It took me about 3.5 hours to hike out, arrived at 3:10pm – rangers were gone but they had a drop-off for the bear cannister. I was beat. I took off my boots and it was awesome – they were still pretty new and rubbing me raw in weird places. I grabbed a beer at the lodge and hit the road back to SF around 4pm. I stopped at In-N-Out and had the most delicious burger and fries ever. I made it home by 9, and went out to Amnesia for some brasstax action. Yay. In Summary, I hiked about 30 miles over 3 days with about 4,400 feet elevation gain. You can check out my hike info from GPS Watch (it shows just the going up part, batteries ran out at east lake). Also view the Google map of the hike. At some point I want to do Rae Lakes Loop Hike, a 4-7 day trip. It is supposed to be so Amazing, one of the best in the Sierras. Here’s a sample itinerary. 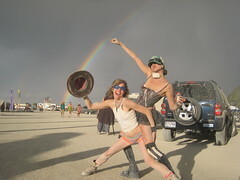 Last of my big trips for the year – Burningman. My ninth time going, always glad i went. This year’s favs include the dust storm thursday, my boy pete hudson’s monkey-snake thing (read wired, mercury news, grist.org), the big rig, and the oil rig tower (hello? coolest fire EVER). Oh, and the glowing ping pong balls – best visuals ever. And how could i forget our very own monkey island art car. Good times, good times. Check out my flickr pics and the youtube videos. I made it back home to San Francisco, California, U, S, and A. Hurray. My Round-The-World trip for 2007 is over. I’m glad to be home, the last few weeks i was ready – i missed my friends and miss shayna. But i loved my trip. I saw things i’ve never seen before, i had experiences that will last a lifetime, and learned a few things about myself as well. What more could you want? First, lemme recount my adventures a bit. I’ll be brief – feel free to check out my itinerary for details of everywhere i went. Last entries were for India – i spent over 3 weeks there, mostly in the mountains doing my trek. After the trek, i headed to Srinagar, Kashmir despite warnings by lonely planet. Up till this year, the was much fighting, but now its cool – i saw a ton of army dudes hanging around. I ended up on a houseboat instead of a hotel/hostel/guesthouse, which was cool in concept, but lame in reality – family turned out to be very dodgy on details like how far it was to town, how much things cost, and always trying to make me buy something. Pissed me off – at this point of my trip i had enough of people pretending to be friendly or honest, and then end up being dishonest and only out to get you to buy something. But i did see some beautiful lakes, mountains, and gardens, and i loved that. 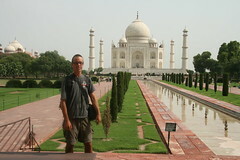 Then i flew to Delhi, hung out there and did a day trip to Agra – home of the Taj Mahal. Wow. I decided that was the thing i liked the most from my trip. The architecture was amazing – the white marble stone, the simplicity, the grandeur, the way it impressed me from all angles, the gardens around it. And altho crowded, the people didn’t bother me like they did at Angkor Wat, Cambodia. The heat really got to me at Angkor Wat. After India, i flew to London for one night, then to Zurich, Switzerland – home of Stephanie Hannon. I mainly wanted to just visit Steph and chill for a few days, but i ended up really loving Switzerland. Expensive, yes, but soo beautiful – I was there 4 days, one day we went to Luzern, another day i went hiking by myself to Speer – and it was amazing. Steph took me to some fancy bars and restaurants, as well as introduced me to some of her friends and coworkers. What a good host. Switzerland – It really is a land out of a fairy tale. From Switzerland i did one more night in London before heading to New York. Lindsey Bauer was kind enough to let me crash at her place in London, and i even joined them for an impressive cirque-de-solei type show done bye nofitstate circus. Once i got to NYC, i stayed with another friend, Suzi Palmer. The western world is too expensive for me to NOT stay with friends, ya know? Greenhouse was, of course, a great host as well. She has cool friends, a happy dog, sadie, and ever rusty cat. What a great family. I also made it to Hoboken to visit Mike, Zuad, and their 2-month old boy. I’ve never seen a house so clean. And then monday i had John’s pizza. SOooooo Gooood. As Jack Black says, “You can’t even order a slice. They make you order a whole pie. But that’s fine with me. 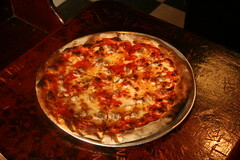 I wouldn’t want to eat just one slice.” NY was nice – good to do some serious chilling out before heading home. Thats it for now – expect a RTW summary some time soon – best and worst and weirdest . . something like that. Now i’m just happy to be home – to have to go through 12,000 pieces of mail, fix my broken laptop, get new ipod, and try to figure out my life ..
I’m just gonna do a quick summary of the month long trip shayna and i took across the country. We saw many beatiful natural and man-made sights, had some tastee meals, experience different cultures, talked, laughed, fought, and slept in the jetta, and thoroughly enjoyed our country. Some of my favorite sights include National Monument in Arizona, Crazy Horse Memorial in South Dakota, Millenium Park in Chicago, the City Museum in St. Louis, and the Cadillac Ranch in Texas. Some of my favorite moments include the touristy animals and mini-town by Zion, seeing Lyrics Born and Cut Chemist in Boulder, having a beer with Shayna in Durango, crawling through the caves in the City Museum, and singing at the top of my lungs in the car (with Shayna, of course). We really could not have had a better trip – the only thing was i wished we had more time – i would love to do a trip with no end in sight. We had tons of fun taking in the sights, learning about various states and cities, but we did go fast and sometimes it was hard to digest. It was definitely hard to upload pics and update my blog as i went, even tho over half the hotels we stayed in had free wifi. Of course, it never sux when your only complaint is having too much fun. Now i’m off to Costa Rica for a little over 3 weeks, 2 weeks on my own and then Rick and Zetta’s wedding. See ya later !!! The last week of the trip was a quick 6 days from the east coast back to California. Not super rushed, we still had time for a few stops, but the leisurely pace of the first 3 weeks was over. I left Vegas late sunday on the redeye to DC. Shayna picked me up Monday at 6am, and we went back to her parents to take a little nap. Shayna had been there since late friday night – she drove 14 hours friday to DC from St. Louis, over 800 miles, the longest drive of the trip. So she had already spent some time with her parents, which is nice. After our nap we got up and went to lunch with her parents then hit the road. We wanted to be in Athens, Georgia, by monday night, and we made it around midnight. Hurray. Tuesday I woke up early and went to a coffee shop, then got a run in before we hit the road. Shayna was out late in Athens with her friend Jillian, who so graciously hosted us, so she slept in a bit longer than I. We jetted to Atlanta to meet up with my family – mom, dad, Leslie, Michael, and my 9 month old niece Katherine. It was a quick lunch, mainly to give Les my old windows laptop, but it was nice to see them all. I grew up in Atlanta, and i showed shayna my parents house on our way out of town. We made our way to nashville for dinner – we couldnt’ find the restaraunt we wanted so ended up eating sushi. We then drove through torrential rain to spend the night in memphis. When we arrived we had a couple drinks on Beale Street, which is similar to New Orleans Bourbon street, then we hit the cheap motels again. Woke up and went to Graceland, the home of Elvis Presley. It was entertaining to see his place, but more entertaining to be part of the experience, trying to understand america’s infatuation with the king. He had a great voice, charisma, and unusual style. His house was great – each room had its own theme, like the yellow and dark blue TCB (Takin’ Care of Business) room in the basement to the jungle room with green shag carpet on the floor and ceilings. 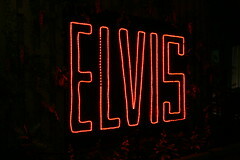 But my favorite was the converted athletics room – the racquetball court was filled with gold records and elvis outfits. It seemed to capture the elvis vibe the most. 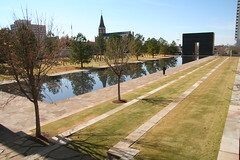 The Oklahoma City Memorial turned out to be one of the most moving sights on our tour. The bombing occured in 1995, killed 168 people including 19 children in the daycare center, damaged hundreds of buildings, many had to be destroyed, including the Murrah federal building which was the main target. The memorial was completed in 2001, just a few months before 9/11. Not sure exactly why i was so moved, i think it was feeling the courage people had when faced with tragedy, seeing and hearing people rising to the occasion. They presented a timeline of the events in different formats – mostly pictures with annotations, but also some video and a few computer rooms where you can get more interactive info. I distinctly remember getting choked up watching the video – hearing about people’s utter disbelief when they see the federal building destroyed, where only hours earlier they dropped off their children in the daycare center. They could not comprehend that their babies were not alive. After Oklahoma City we hit the road again, stopping a few times in Texas before making it to Alburqueque. 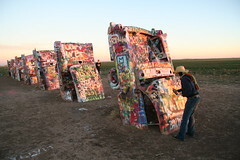 Stops included the big Texan (home of the 72oz steak), the giant cross, and my favorite thing in Texas – cadillac ranch. There were about 12 cadillacs from the 50s, all buried in the ground nose first, covered with years of tagging. And just as the lonely planet predicted, there were cans of spray paint lying around so we could tag the cars ourselves. The beauty of it was just the simplicity of it all, just a bunch of cars buried in the ground, middle of nowhere, surrounded by farmland. This was my favorite thing you could only find on a roadtrip. 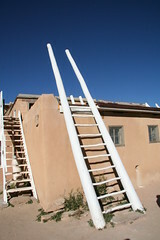 We saw many native american sights on this road trip, but the Acoma Sky City experience could be my favorite. Monument Valley was the most impressive natural sight, and i loved the vision and large collection of native american artifacts at the crazy horse memorial, but our Acoma guide through sky city was the more informed and most moving of all the native americans i’ve come across. He would talk with Love and profound respect about his culture and mother earth as well as with deep anger about how his ancestors were taken advantage of by the spanish. I learned that, like most native american tribes, the Acoma were a matriarhcal people – the women owned the property and made the decisions. This naturally leads to a more peaceful society, compared to some other patriarchal tribes like the navajo and apache, which were known more for fighting. Apache is not an apache term, its the acoma word for enemy. I also learned about their magic numbers 4, 7, 12, 21 and their simple philosophy of teaching their children to respect themselves and they will get respect. Once they know how to respect themselves, they are encouraged to leave the reservation and see the world. Most return. Woke up in Kingman Arizona, thanks to shayna’s late night power driving. The town had a historic route 66 museum, the fourth one we saw, but this time we stopped to investigate. It was informative with many displays, from a miniature railroad to life size trail wagon. It covered the trail before route 66 that settlers took to california, and talked about how the great depressio and drought of the 1930s forced many in the midwest to seek fortune in california along this route. With the boom of the 50s came improved roads and many more towns as more and more people flocked west. The towns were mostly hotels, restaraunts, and gas stations, but all had character. The journey was a colorful experience, but eventually the interstate system and chain stores replaced the character. As they put it, speed and predictability won over adventure. On the bright side, the Historic Route 66 from chicago to LA is now a tourist destination itself, attracting enough people to sustain the older towns that were almost forgotten. 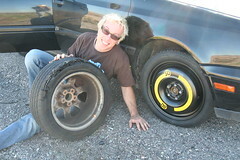 The last noteworthy event on the trip occured in arizona right before the california border – a flat tire. Lucky for us it was actually a fun experience – i quickly put on the spare tire and made it the 30 or so miles to Needles, CA, where i had the good fortune of buying 4 new tires. Apparently i had another tire that was about to go, and since they didn’t have my EXACT tire size, i was advised to buy all 4. It was good advice, and i did. This allowed us to zip on thru california at record breaking speeds to get home saturday night in time to have a drink with friends and retell our stories from the road. That’s it – see my final blog recapping USA.